On September 22nd we shall once again witness the phenomenon of the Fall Equinox. The Farmers Almanac writes: “During the equinox, the Sun crosses what we call the ‘celestial equator’ (just imagine the line that marks the equator on Earth extending up into the sky) from north to south. At this point, the amount of nighttime and daytime are roughly equal to each other.” Ahhh, a beautiful description of an annual occurrence that reminds us just how amazing this planet we find ourselves on is. With fall quickly upon us, summer is having her last hurrah with sweltering heat by day that envelops our nights without remorse. Alas, as yogis we know that the weather is just another detail in a world designed to encourage us to resist the temptation to resist! Complaining about the weather is a breach in your concentration to allow life to move through us and not to get stuck anywhere at anytime for any reason. Life is flow, endless flow. 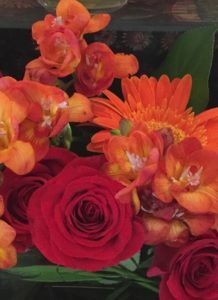 Preferences abound in our psyche, true enough, yet losing one’s poise when preferences are not present pushes us against the flow and then energy shifts from natural movement ever onward to a dicey interlude in the whirlpool. Yeah, it’s hot. Before long…it will be cool. So relax and enjoy the ride and lean into your yoga practice to cool, pause, breathe, and draw into balance. What a gift! As we step into September, it ushers in the single most important event that we have been involved with since Param Yoga opened almost seven years ago. We are celebrating the 125th birth year of our Param Guru, Paramahamsa Yogananda, with a Public Lecture at the Poverello of Assisi Retreat House in San Fernando on 9/11. 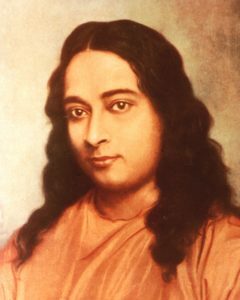 Yogananda has been and continues to be a tremendous presence in my life, and to celebrate him is a privilege and a great joy. Without him there would be no studio, no community, no constant movement forward in the spirit of Love, Service, and Meditation. Even more profoundly, he has drawn the carrier of his own Shakti into my life, Paramahamsa Prajnanananada. To me they are One, have always been One, and shall always be One. 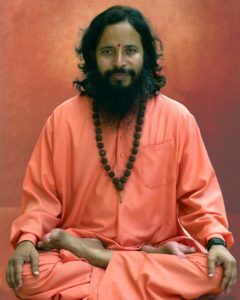 And Paramahamsa Prajnanananda, in person, will be our keynote speaker on 9/11 to shower us with his Eternal Love. This event is for YOU. It is the greatest gift that I could ever offer you: a moment in time to observe one who knows. You will immediately know that he knows, and within you something will resonate and you will be Love. Because that is what these Masters are offering us in order to live in love, to communicate in love, to breathe in love, to remember love…only Love. Please join us and invite the ones you love so that they too may have a glimpse at eternity before their very eyes.